At 79 years old, Greg Hildebrandt has decided to create his take on movie posters from the 30’s, 40’s and 50’s–and they are larger than life! Back in April, Greg began his newest artistic journey, titled, “What If?”. The idea behind this series is for Greg to create today what he would have done if he was hired to do the original movie poster for some of his favorite movies from his childhood and youth. 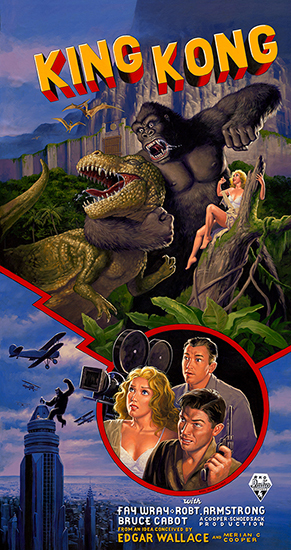 The second piece Greg wanted to do for this series was the 8th wonder of the world, the 1933 classic film King Kong! After seeing the film in a local theatre in Detroit, Greg became so obsessed with this film that he has watched it every year since as a Thanksgiving tradition! Greg decided to do this painting in a larger than life fashion so he designed it as a three sheet. A three sheet is a common term for a movie poster that is normally approximately 3 times the size of the most common used poster, called a one sheet. At 86” tall, the painting truly is a wonder!